to see and do, you won't want to go home! Whether you're interested in championship golf, hiking, mountain biking, or music, it's all right here in Southern Vermont! In fact, The Long Trail is a hiking path traveling 265 miles north/south the entire length of Vermont and is only a 30 minute drive from us. Mount Snow championship golf course, a mountain biking facility, Orvis fly fishing instruction, gift shops, a quilting store, petting farm, winery, large flea market, ferry boat tours and more are only a few minutes away. Strolling of the Heifers is a celebration of cows, farmers, artists, and the sustainable practices that nurture and preserve our families, communities and rural way of life. Our little Vermont bed and breakfast is a great example of that, because we are also a small working farm that can appreciate all that farming has offered our family over the years. 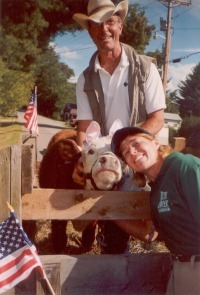 The annual Strolling of the Heifers parade/festival will be held on Main Street America, taking place in June, not far away in nearby Brattleboro, Vermont. As Farmer Bill has in the past, he'll be walking one of our calfs - assuming we have one that is the right age at the time. The calf shown here is "Valentine", a spendid heifer who had a most wonderful time a couple of years ago, participating in the strolling event. He was dressed up with pink rabbit ears and loved getting his picture taken with our guests. Needless to say, Valentine make this guest's Vermont vacation one to remember. Each summer, on a rural hilltop in Marlboro, Vermont, master concert artists gather with exceptional young professionals on the campus of Marlboro College, not far from Shearer Hill Farm. For seven weeks, the musicians rehearse, exchange deas and play together as one large musical family. Concerts take place on weekends from July through August and tickets are available up until 48 hours prior to each concert event. Tickets for the upcoming season will be available online beginning April 1 at MarlboroMusic.org.3 If you need tickets, simply let us know and we can help. 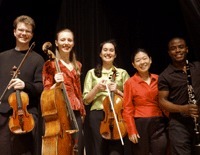 We hope you'll join us this year to enjoy some wonderful chamber music in the mountains of Vermont! 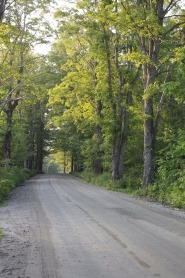 Don't get us wrong, we love tar roads as much as everyone else, but when the snowpak in Vermont melts and the trees bloom, the dirt road to our B&B is simply beautiful! Sometimes it's just nice to get away from modern conveniences and travel down a road less traveled. But now-a-days it's actually difficult to find a dirt road without traveling some distance from the city. 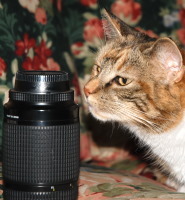 But, that's OK. We like that our B&B is located in the rural mountains of southern Vermont, and our guests do as well.